There are dozens of different varieties of mystery novels, and I have read at least 2000 of them. Some of these books feature ex-cops who have become PIs (private eyes). Some mysteries, mostly written by British female authors, are called cozies because of their genteel manners and settings. Then there are mysteries in which the setting is all-important — New York, Los Angeles, San Francisco and Chicago being some of the more popular cities. Then there is a whole category of mysteries that feature certain professions — lawyers, doctors, chefs, and musicians come to mind. Another genre features certain animals — horses, dogs, cats, and parrots. Alan Annand has created — or expanded upon — a whole new genre: Vedic Astrology and detective. Our hero in “Scorpio Rising” is also a fine palmist, numerologist, and expert in Vastu (ancient Vedic laws of architecture) and Ayurveda. Being a lover of mysteries (especially the “hard-boiled” type) and of all things Vedic, I believe this book is a 5-star winning combination. Without giving any of the plot away, here’s the gist of it: Criminal profiler Axel Crowe investigates the killing of a New York City heiress, only to discover that her death is linked to two other murders on the same day: a dot-com millionaire in San Francisco, and the team leader of a CIA counter-terrorist project in Los Alamos, New Mexico. A finder of wayward people and stolen possessions, the enigmatic Crowe profiles subjects in a distinctly unique manner, using astrology, palmistry and other techniques drawn from Vedic lore. Facts are gross, but the truth is subtle, Crowe’s guru always told him. And although the truth behind this three-way conspiracy lies buried in the past, Crowe is relentless until he uncovers it. If you think about it, astrologer and detective go together like fish and chips. Astrologers look for that which is hidden, and so do detectives. Both professions value intuition and logic equally. Mr. Annand has done a masterful job in creating a believable character who is personable, intelligent, and multi-faceted in his approach to crime solving. “Scorpio Rising” is a truly great book. And according to the author, it is just the first in a series of several books featuring this astrologer-detective character. If you love Jyotish, palmistry, etc, READ THIS BOOK! You will learn a lot of predictive techniques because Mr. Annand, besides being a writer, is also a very fine Jyotishi. 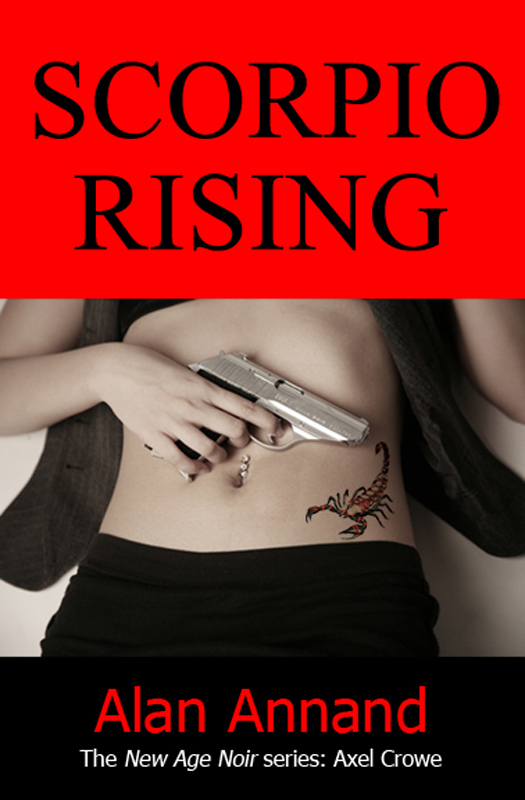 Scorpio Rising is available from Amazon — paperback $12.99, digital only $2.99. I really loved this book. A lot of action and a soft side. Alan Annand is a fine writer with an edge. His character Axel Crowe is knowledgeable and focused. His mind is always on the go. It is interesting to go into the life of an accomplished Jyotishi and see how he handles a future relationship. It is refreshing to read about a man who knows how to respect boundaries.